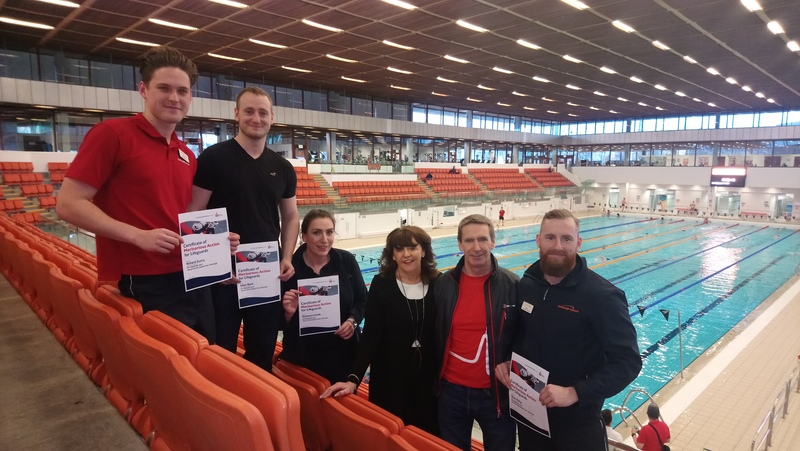 Four Edinburgh Leisure staff from the Royal Commonwealth Pool, have been awarded the prestigious Meritorious Lifeguard Award, by the Royal Life Saving Society UK (RLSS UK). On the day that saw the launch of the Scotland Drowning Prevention Strategy on 31 January 2018, the team were presented with their awards by RLSS UK, CEO Di Steer at the Royal Commonwealth Pool, Dalkeith Road, Edinburgh. On 12 December last year, Gary Hall, 57, from Liberton, who is a Royal Commonwealth Pool gym member, collapsed whilst running on a treadmill and thanks to the swift action of Adam Blyth, Kate Cramb, Richard Gurry and Dean Philip, Mr. Hall recovered sufficiently to be taken to hospital for further treatment. Leisure attendant Richard Gurry, who was off-duty at the time of the incident and happened to be training in the gym, was the first on the scene and was quick to recognise the need to administer CPR. Responding to the emergency alarm, Kate called the ambulance, Dean prepared the defibrillator and Adam took over the CPR compressions until the ambulance arrived. The team were overjoyed when the customer successfully revived and was able to chat and answer questions, before the paramedics took over. Edinburgh Leisure runs a number of RLSS UK Lifesaving courses and also First Aid Courses. All of their First Aid courses are accredited by Ofqal and presented in association with RLSS UK, which ensures the qualification is recognised nationwide.